Editor's Note: At The Oregon Wine Blog, we're always scouting new talent in the wine blogging world. Really, we just have a lot of friends who like to drink wine and show some interest in writing for the Blog. In that spirit, we bring you this guest post from Clare Cady of the Semi-Urban Homesteader blog. Who knows, she may be our next staff writer. Just recently my partner Jason and I trekked south to Jacksonville, OR, to visit friends who have a natural building school. Between climbing in the mountains, grinding wheat with a bicycle, and drinking homebrewed beer, we slipped out for lunch and a chance to check out the town. Jacksonville prides itself in its history, so it was only fitting that we stop in at a local landmark. Built in 1865, the then private residence of Patrick Ryan has been host to more local businesses than any other building in town. Currently it is the home of South Stage Cellars, a vineyard-based tasting room and wine garden. We walked away with a bottle of their 2009 Early Muscat, sold on the promise from the woman in the tasting room that it served both as a delightful dessert wine as well as an aromatic white. It felt like a big claim to me and so was intrigued. I was impressed with the quaint, cozy feel of the tasting room along with the rows of medals and awards that lined the wall behind the bar. The 2008 incarnation of the Early Muscat won Best of Show at the 2009 World of Wine Festival. We were also excited to see how committed South Stage is to supporting the local economy and community. The grapes come from owners Don and Traute Moore’s vineyard, Quail Run, a local 300 acre operation that utilizes no insecticides and utilizes cover crops as a means to enrich the soils. We noted that there were several events aimed at locals providing discounts and entertainment. Our friend Coenraad had been there just the night before performing at a local’s night. Some weeks later we decided to give our southern belle a try. A pale straw color, I expected something touted as a potential dessert wine to be more syrupy, but it seemed more like an aromatic in the glass. The nose consisted of honey and a tropical fruitiness that we were initially unable to identify along with hints of clove. I found the taste to be powerfully sweet on the tongue with a slight sparkling texture and a lightly bitter finish, almost like grapefruit. Jason noted that he found a “zing” at the top of his palette that was just as much texture as it was flavor. After exploring this further we decided that this was the tropical fruit we’d gotten on the nose – guava. The whole experience was threaded with the light spiciness of clove that carried through from start to finish. We decided that the claim that this wine could be either a dessert wine or enjoyed by the glass with food stood up to the test. The Early Muscat provided more than enough complexity and crispness to drink chilled with a citrusy piece of fish or a mild Thai curry. 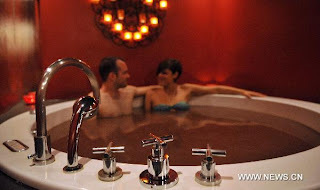 However, its bold sweetness and bitterness would make it an excellent complement to dark chocolate or summer fruits. I definitely enjoyed this versatile wine and would recommend it to anyone who enjoys sweet wine with a kick. Walla Walla to Portlandia: Will the Dream of the 90s Survive? If you haven't heard by now, the Dream of the 90s Is Alive in Portland. Young people retire there, you can sleep until 11:00am and all the hot girls wear glasses. 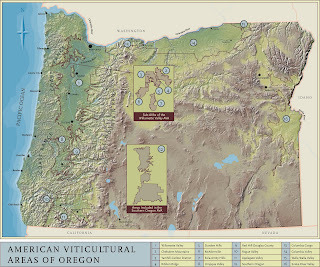 Besides its earnest hipness, Portland also plays the role of urban guardian to the Willamette Valley wine country just to the south. They know their wine in Portlandia, and they’re particularly fond of the world class Pinot Noir that grows just to the south. But Pinot Noir is grown elsewhere, and Walla Walla’s wine association is hopeful that Portland will give some of the world class wine from Walla Walla a try for a change. 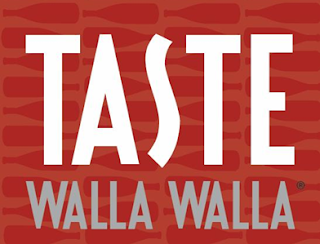 Taste Walla Walla in Portland, on February 28th, gives those Portland Pinotphiles an opportunity to sample world class Washington wine from more than 50 of Walla Walla's 120 wineries. The event, at Venue Pearl, is a great way for Washington's neighbors to the south to be neighborly and check out what's going on in the Walla Walla Valley, a part of which is in Oregon. Tickets are available at the door for $65, and the event will feature Walla Walla food and wine and an opportunity for Portlandia to open its mind. They say in Portland that world class Pinot Noir flows out of faucets and falls from the sky. They also say you can go to clown college. As much as I love Portlandia, I am still an outsider amidst its city streets. That's partially because I'm living in Seattle and partially because I'm a bit on the masculine side for Portland. So I had to get an insider's view. I wanted to know how Portlandia would deal with these world class iterations of Rhone and Bordeaux style varietals? Could these wines, nuanced and elegant compared to their New World counterparts, but big by Willamette Valley standards fit in; in this Mecca of skinny jeans? Could they play nice together? Was the Dream of the 90s prepared for one of the finest AVAs in the country coming to town? Jenny M is my Portland insider and she wears glasses. In case there was any question about her credentials, Jenny pours world class Pinot by day, but her day doesn't really get started until around 11:00am. When I told her that Walla Walla was coming to Portlandia she was beside herself. "Walla Walla in Portland?! What do you think they're trying to do? "In Your Face," I think that says it all, doesn't it? It’s obviously just another facet of the Cabernet industrial-patriarchy takeover. It just sounds so violent, right? Why does it have to be in my face? Have you even seen what most of those bottles look like?! Those "big" Washington wines are just part of varietal-phallocentrist oppression." Jenny continued, “Think about it: How many women winemakers are even IN Washington? There are like, a lot in Oregon. I think that says something about how progressive Pinot Noir production is here, comparably. I mean, it's like really progressive." Jenny was concerned that in addition to the lack of feminism there was a lack of in touch with naturism, and I tried to assure her that we had both amazing woman winemakers in Walla Walla like Marie Eve Gilla of Forgeron Cellars and Anna Schafer aMaurice Cellars and really nature-y type people too. She wasn't hearing it. What I did find was that despite her initial reaction, Jenny had a weak spot for Portlandia-centered marketing, which basically amounts to the artful use of bird imagery. "I was in Whole Foods today, buying this really yummy spelt bread, when I happened to see some Washington Cabernet with a pretty bird on the label. Like, do they think that's all it takes?! I mean, yeah, I bought it! But that's not the point! The point is, "Bordeaux-style"? More like "Bour-don't style to me"! While the Walla Walla Valley Wine Alliance has work to do to convince this particular Portlandia die-hard, I do believe there’s a good chance that they’ll make a serious impression on the hipster Pinot guzzlers. If nothing else, Walla Walla is going to throw one heck of a party in the fashionable Pearl District and hell, Portlandia likes parties. A big thanks to Jenny for bringing the humor and the hip to this post. 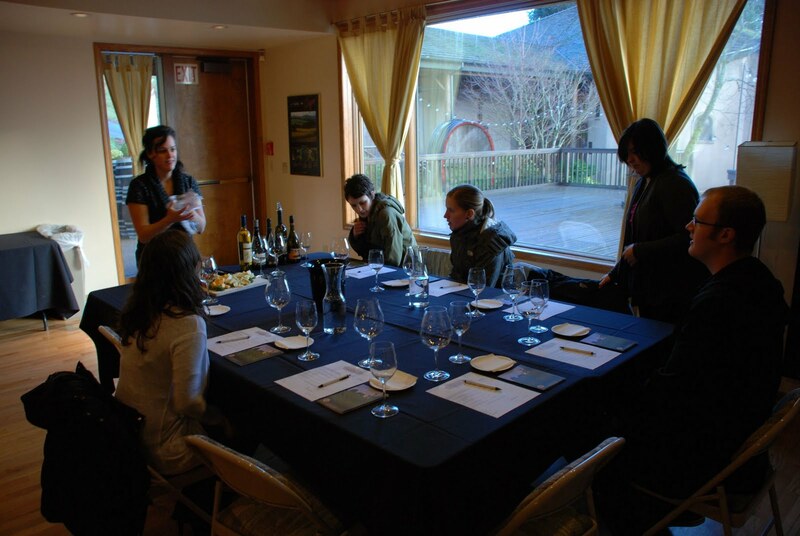 Since beginning The Oregon Wine Blog, one quality we've strived to stick to is breaking down the wine industry in a way that makes it accessible to young people who don't know anything about wine. These folks are usually intimidated by the thought of driving their Honda up a long, winding driveway and parking it in front of a beautiful chateau just to belly up to the bar and not know what to ask for. We know this feeling, but the truth of the matter is it just isn't the case in the Pacific Northwest. We've broken this down numerous times, but it's time we prove our point in person. 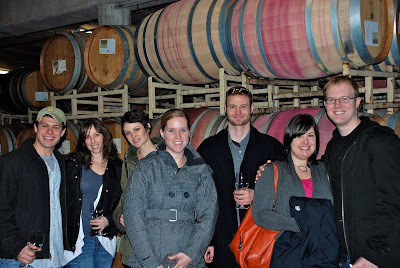 For our first journey, Josh and I took Alyssa, Cole, Shannon, Laura, and Chelsea to Willamette Valley Vineyards. 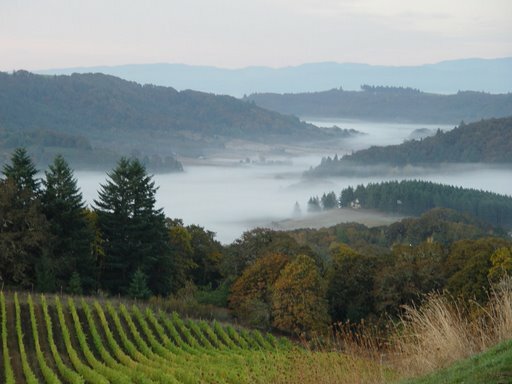 Why Willamette Valley Vineyards? For one, they make a little bit of everything. I had no clue what kinds of wines were going to be popular with this group, so it was a safe bet bringing them somewhere that produces pretty much the entire gamut of wines. Not only does this help my friends decide what kinds of wine they like, but it selfishly helps me narrow down what to bring to gatherings. I'm not saying that I particularly minded drinking an entire bottle of Latah Creek Petite Syrah by myself, but I also don't want to be that guy. The second reason is even more important than the first. We weren't just getting any tour; oh no. We were getting a tour from Willamette Valley Vineyard's very own Wende! Wende is super rad and guided our tour during the Le Tour De Pinot Finale, so we knew our friends were in for an awesome experience. 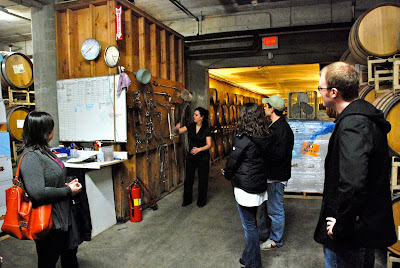 After quick introductions, we were guided into the main hallway and given a brief history of the wine industry in Oregon as well as the story of how Willamette Valley Vineyards came to be. We even heard about how cork is harvested! While I'm sure our group didn't retain absolutely everything, it was really great hearing an explanation about the industry from somebody who actually works in it. For me, the industry itself is almost as fascinating as the wines it produces and from the feedback I got, everybody in our group really appreciated hearing about it. With our history lesson over, it was time to hit the wine making facilities! Here we got to walk through their cellar, wine making facilities, and even saw a bottling line. Wende broke down the complicated methodology of making world-class wine into terms so simplistic that Cole even started throwing out questions regarding creating hybrid and custom grapes. While he probably won't end up changing careers to winemaking, it was clear that everybody left with exponentially more knowledge than they had when they showed up. With the tour out of the way and one glass of Pinot Gris down, it was time to do some tasting! Instead of bellying up to the bar and going down a tasting list, Wende had other plans for us. Upon walking out of the bottling room, we were lead into a separate event space and had a private table laid out with gourmet cheeses and five different bottles of wine. Have I mentioned how awesome Wende is yet? Because it's a lot. 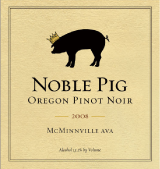 Pinot Noir: Ranked towards the bottom of peoples favorites of the five. I was kind of shocked because WVV's Pinot Noir is fairly light, fruit-forward, and not at all offensive. It turns out that while they're all wine novices, it was actually too simple for their palates. Even Cole, who can often be found with a Coors Light, shrugged it off. Founder's Reserve Pinot Noir: This was a home run with the entire crew. Everybody seemed to love how bold it was and how the flavors changed as each sip evaporates off the palate. Wende also showed us a cool trick of rolling a pinot glass on its side with wine still in it, so maybe that had something to do with it. Griffin Creek Merlot: This was about as varied in opinion as I thought it would be. Surprisingly, this was one of Shannon's favorites. Shannon tends to drink Rieslings and Pinot Gris, so I'm still a bit perplexed as to how her palate works. That said, she really enjoyed the medium spiciness from this Southern Oregon favorite. I may just have myself a new red wine buddy! Tualatin Estate Frizzante Muscat: Not at all surprisingly, this was a hit with everyone. It's practically wine soda! Griffin Creek Viognier: This was perhaps the wine of the day. While our guests didn't have experienced enough palates to express every nuance of this wine, they all had the realization that there was a whole new dimension to white wine that they didn't know was there before. Whole Cluster Pinot Noir: This wasn't one of Wende's wines, but I made everybody try this on the way out. This ended up being a big winner as well, which still has me scratching my head as to why the regular Pinot Noir wasn't. Oh well. Somehow we resisted the urge to buy the 2000 The Griffin as well as a magnum of port; instead leaving with a few bottles of Griffin Creek Cab Franc. As a somewhat regionally-respected wine journalist, it is my semi-professional opinion that you can never have enough Cab Franc on your rack. All in all this trip was a huge success. The Oregon wine industry just gained itself five new customers and I got an excuse to visit one of my favorite wineries. 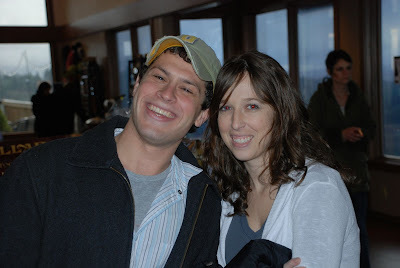 A huge thanks goes out to Josh for coordinating the reservations and another out to Wende for being WVV's Senior Executive Director of Awesomeness. Look for more of these posts as I drag my non-enophile friends to other wineries! You've probably noticed a marked decrease in the frequency of posts lately, especially from yours truly. If you are observant, that is. I moved to Seattle a week ago and have been getting settled in. With the move wrapped up, on Friday I resolved to kick it into gear and get a post knocked out this weekend. This post. The problem was that I didn't have a vision in mind, and while I have a ton of wine on the rack, nothing was jumping out for the post. Saturday morning I connected with Andrea of Le Tour de Pinot fame, and we set off to explore my new neighborhood (Ballard). We ended up at the local wine bar that Rick and I had found the previous week, and fortuitously they had a complimentary tasting going on. California tasting, that is. While I enjoyed the tasting, I didn't take any notes or pictures so you'll have to keep your eyes peeled for a post dedicated to Portalis Wine Shop in the coming weeks. Andrea and I parted ways for the evening and I was left reconsidering my options for a post. The first thing that came to mind was the next in the "They Make Wine There?" series, with a bottle of Utah chardonnay in the hopper. I wasn't feeling white that evening, so a bust on that one too. What was a boy to do? Wait a minute! Right about then I remembered something that had jumped out at me twice per day every day for the past week on my foray into the public transportation world to work. Wine World Warehouse. It's right there on NE 45th right off of I-5 in Seattle, tantalizing me with 23,000 square feet of wine through the bus window. Yes, I would go there and find a bottle of wine to drink and review. I needed to be more specific because trying to find a bottle among the 6000 Wine World carries would have been seeking a needle in a haystack. With that in mind, I set the following ground rules for my selection: the wine would be obviously from the Pacific Northwest, one that I hadn't tried before, under $20, and something with a story behind it. I drive the 3 miles from my condo to Wine World (how convenient), and was welcomed with dedicated parking and a shop that is open 11 AM - 9 PM on Saturdays with free tastings every day of the week at the gorgeous bar in the middle of the shop. I had missed the tasting, but was immediately drawn to the Washington section in front of me. Wine was organized by geographical region, then varietal, then vintage; a strategy that might be a bit challenging for a wine virgin but I very much enjoyed the layout. There were some wines that stuck out right off the bat. The Leonetti Merlot was tempting, but at $89 it was a bit more than my $20 limit. Kiona and Terra Blanca are always winners, as is Cougar Crest, but I couldn't fall back on the familiar. It needed to be new and unique. 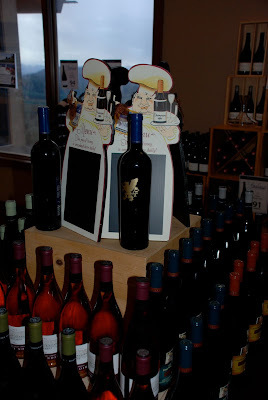 I circled around the store a few times, and found myself back in the Washington Merlot section. In front of me was a Heaven's Cave Inspiration. It looked unique, was $19.99 (fine, a little more with WA tax), and was single-vineyard designate from Alder Ridge in the Horse Heaven Hills. Done. 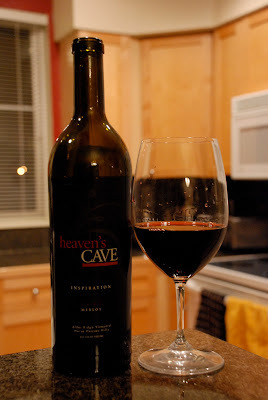 Heaven's Cave Cellars is a for-benefit winery that chooses to donate a portion of its profits from wine sales to cover 100% of the operating expenses of the Make the DASH Count Foundation, a 501 (c) (3) nonprofit dedicated to both developing the next generation of community leaders and benefiting at-risk youth. 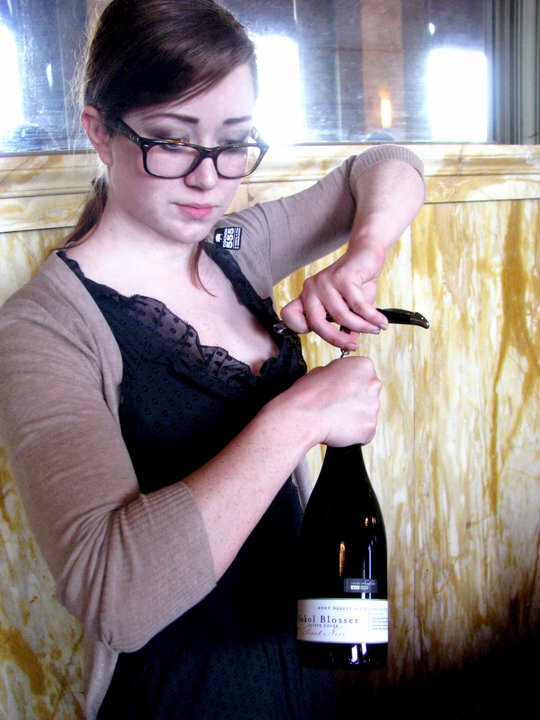 Heaven's Cave owner Hope Moore additionally partners with vintners from Alexandria Nicole, Hedges, DeLille, and Reininger in the Dash Wine Project. The Make the Dash Count foundation, with a vision of To creating an army of youth philanthropists who will serve as community leaders throughout their lives, was the perfect reason to crack open the bottle. See, I really was drinking for charity. Here's what I thought. After allowing the wine to open up while cooking dinner, I found a very jammy and fruity nose packed full of red fruit. Upon sipping, the mouthfeel was very smooth and it was apparent this is a well-structured wine. As the wine coated my palate, I got a punch of tannin and heat on the end. My immediate thought was that this would be a better food wine. Good thing I had dinner in front of me. As I started to eat and continued sipping the wine, it paired extremely well with the raspberry chipotle bbq pork chop on my plate. This Merlot earned an Excellent rating from Wine Press Northwest with fruit 100% sourced from the Alder Ridge Vineyard in the Horse Heaven Hills. With a production of 112 cases, pick up a bottle and make pour your own glass for charity. I'm going to have to make it a practice to pick up some wine now and then that I haven't tried; this was a a winner and Wine World Warehouse will undoubtably provide me endless opportunities to do so. The Seattle Food & Wine Experience is coming up soon, and will be held on February 27th at the Seattle Center. The title “The Seattle Food & Wine Experience” is a bit of a misnomer when it comes to the food and wine you get to experience. Although since it is in Seattle, I suppose that part is spot on. What the title doesn't tell you though, is the full scope of that experience. It has a reach well beyond the wines of Seattle area wineries, though Woodinville’s Convergence Zone Cellars and Hestia Cellars are represented. The wine experience though goes further: to Wenatchee and St. Laurent Winery, to Red Mountain and Hightower Cellars, and further afield to Walla Walla and the wines of Glencorrie. I suppose they could have called it “The Washington Food & Wine Experience in Seattle,” though that really doesn't do it either. The wineries are coming from outside Washington, including Idaho. Yes, that Idaho. 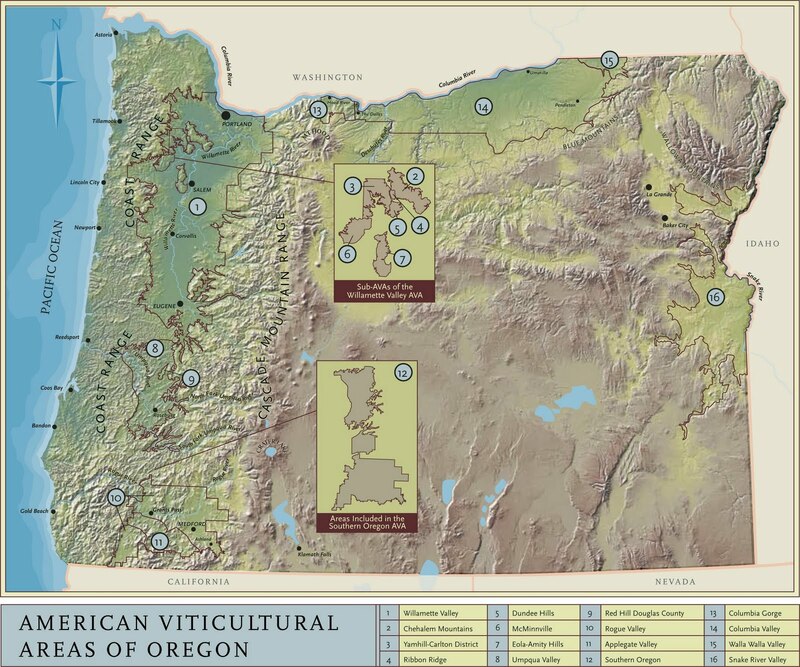 There are, of course, wines from our neighbor to the South, Oregon. Ten Oregon wineries will be showing their wares, including Anam Cara Cellars, Cayalla and Archery Summit. There are also plenty of wineries from California. Somehow there are more California options than the Northwest put together. Maybe there's a good deal on Jet Blue for those folks flying in from California? In any case, there are close to 50 California wineries. Perhaps a more appropriate name would be “The Northwest (Plus California) Wine & Food Experience in Seattle?” If you’re still playing, I switched up the place of “wine” and “food” because I don't believe the food is coming from anywhere but Seattle, but it was really just a precaution. In addition to the fact that the more appropriate name has gotten a bit lengthy, it's also not complete. Italy, you hear me, Italy is also in the house. So is France, and maybe Germany. There's also breweries, the kind that brew beer, and cider. It's gotten a bit out of hand actually, and now we’re looking at “The Northwest (Plus California And Also Some European) Wine, As Well As Beer/Cider & Food Experience in Seattle. I plan to pitch the new name to Jamie Peha who's thrown this party together. I do think adopting the new name may take some time, and so I highly recommend you get should go ahead your tickets to the event (available here). Regardless of the name, it's going to be a helluva good time.